Note, 4 Versions: NT2Z (with ZM1000 Nixie tubes) and NT2R (with no nixie tubes, but made to accommodate the Russian IN-14 tubes). 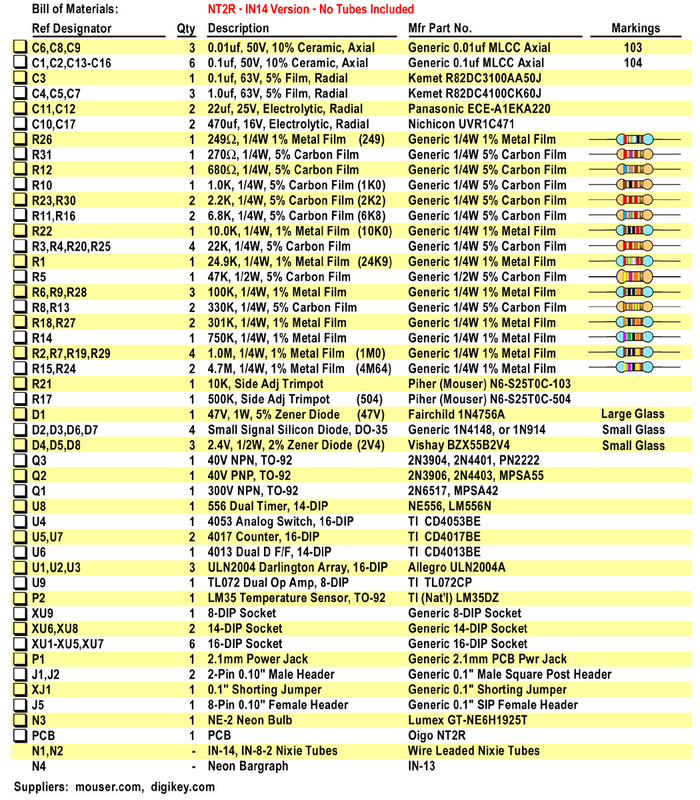 The NT2ZA has replaced the NT2Z, as of April 2017. 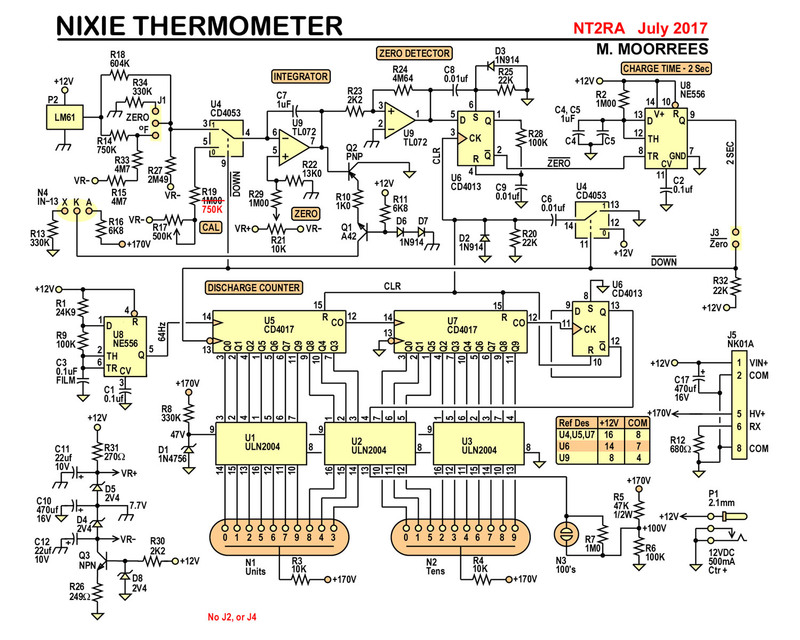 The NT2RA has replaced the NT2R as of August 2017. August 1, 2018: NT2ZA has been discontinued. Last “Z” Kit sold today. May 5, 2018: The NT2ZA will be discontinued, since I have depleted my inventory of ZM1000 nixie tubes. Once the few NT2ZA kits are sold, they will no longer be relisted. Only the NT2RA kit will be sold from now on. August 10, 2017: The NT2RA is replacing the NT2R. The “zeroing” procedure now matches that of the NT2ZA. Trimpot holes now accommodate either “side” or “top” adjusting devices. Sensor has been changed to an LM61, for this version ONLY. 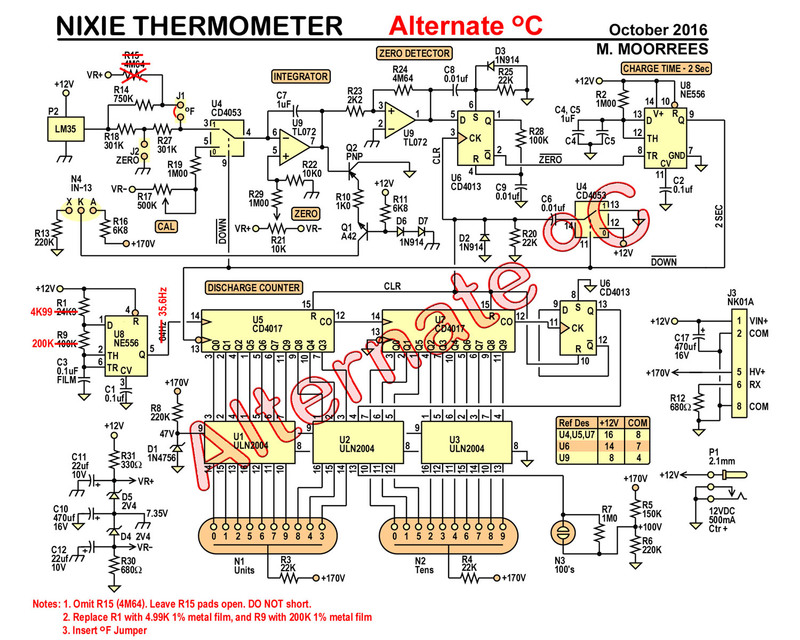 Associated resistor values have been changed, to adapt to the LM61. April 2, 2017: The NT2ZA is replacing the NT2Z. Resistor values now match the NT2R. Additionally, the “zeroing” procedure has been altered. Also fixes the trimpot mounting holes, that are fixed in the NT2R, but not the NT2Z. The build instructions for the NT2Z and NTZA are presented first, followed by build instructions for the NT2R. This unit is generally safe. It poses no fire hazard, since its intended to be powered from a 12VDC wallcube, and nominally draws less than 200mA (less than 2.5W power usage). 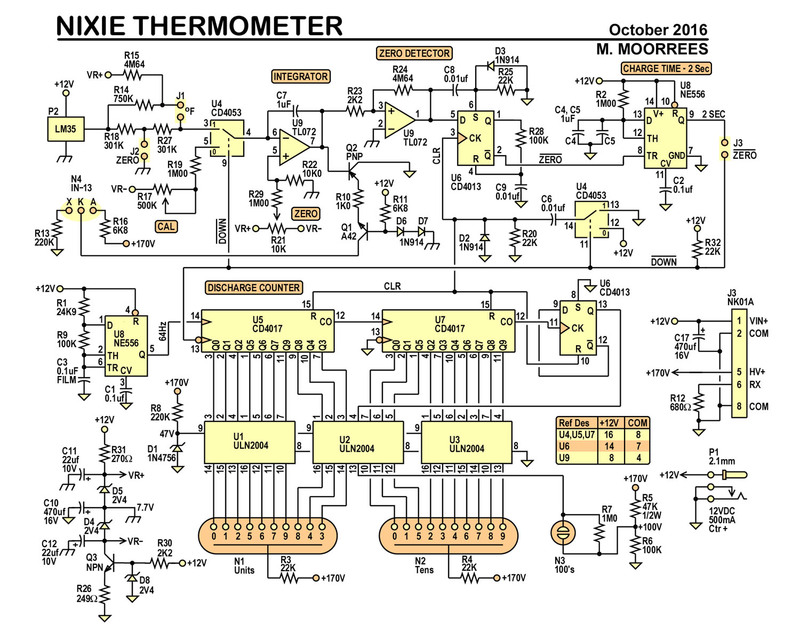 It needs to, however, provide 170VDC to power the nixie tubes. This is done by the additional NK01B (or NK01A) supply, that plugs into J5. 170V will “bite” you, if you get your fingers across it. This should be no issue, unless you have a serious heart condition. In general, though, try not to get bit, and avoid handling, when ON. 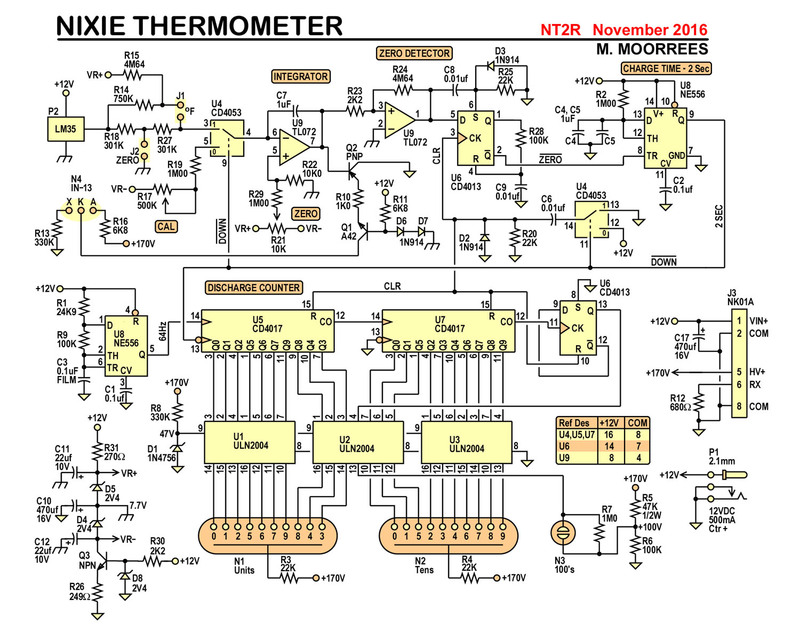 There are already several nixie tube, or neon bargraph thermometers, and thermometer kits, on the internet. 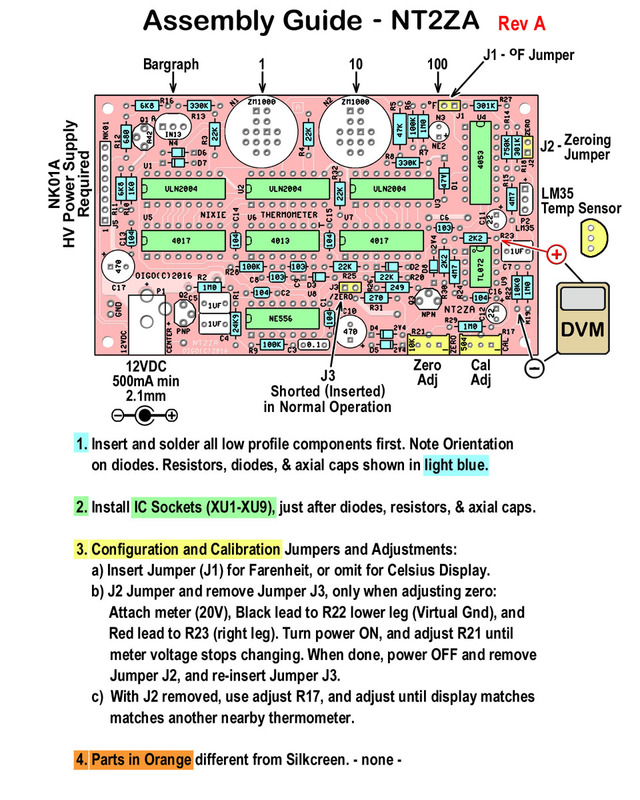 The unique feature of this particular kit, is that designed using no microcontroller. 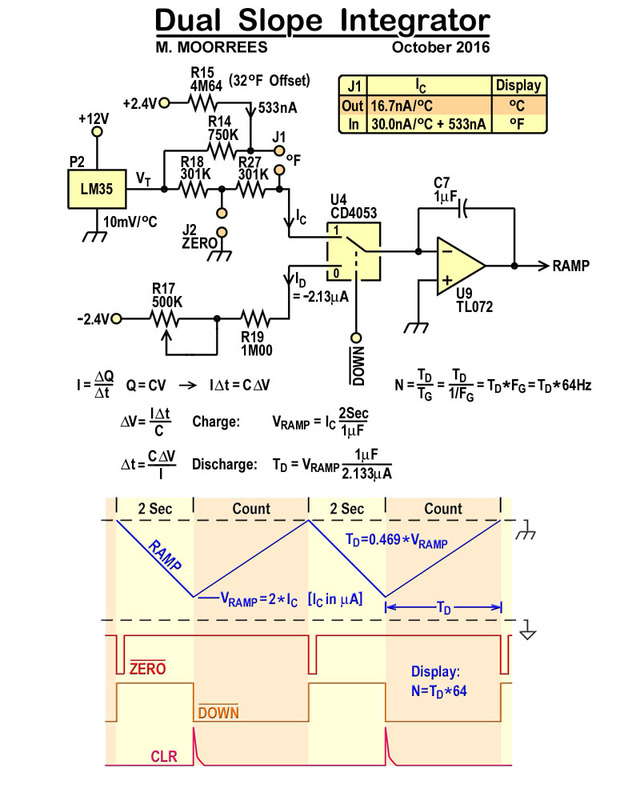 Converting the analog voltage from an LM35 sensor to a digital display, is performed using an special Analog-to-Digital Converter (ADC), know as a Dual Slope ADC. This type of ADC is (was ?) commonly used by digital voltmeters. Conversion rate is slow, compared to other types of ADCs, but this type of ADC is very immune to noise. A dual-slope ADC, as the name suggests, has two slopes. A rising, or charge slope, and a falling, or discharge slope. This dual slope signal is generated by feeding the unknown (measured) voltage into an integrator circuit, for a fixed time. Then discharging the integrator, by applying a know voltage of opposite polarity, until completely discharged (oV). The time, Td, it takes to discharge is proportional to unknown/measured voltage. A counter can be used to count pulses for the duration Td. That pulse rate can be adjusted, such that it corresponds to the voltage, or in this case temperature. Here the output voltage of the LM35, is converted to a current, Ic, by passing thru several resistors. This current will be proportional to the charge rate, and is measured for a fixed 2 seconds. This is the charge slope. Next, the analog switch will select the discharge current, Id, which is nominally calibrated for -2.133uA. The counter is cleared, and allowed to count the pulses, for the whole discharge duration. Counting halted, when the ramp hits zero volts. Note: that in this circuit, the dual slope ramp, is below the integrator’s ground potential; always negative. Also, the integrator’s Op Amp inverting input is also kept at ground by the feedback mechanism, of that op amp. That way, both input currents, Ic, and Id, are simply their, respective, input voltages, divided by the their resistances, since one leg, is always at ground (0V). This circuit can display the temperature in Celsius, or Fahrenheit. 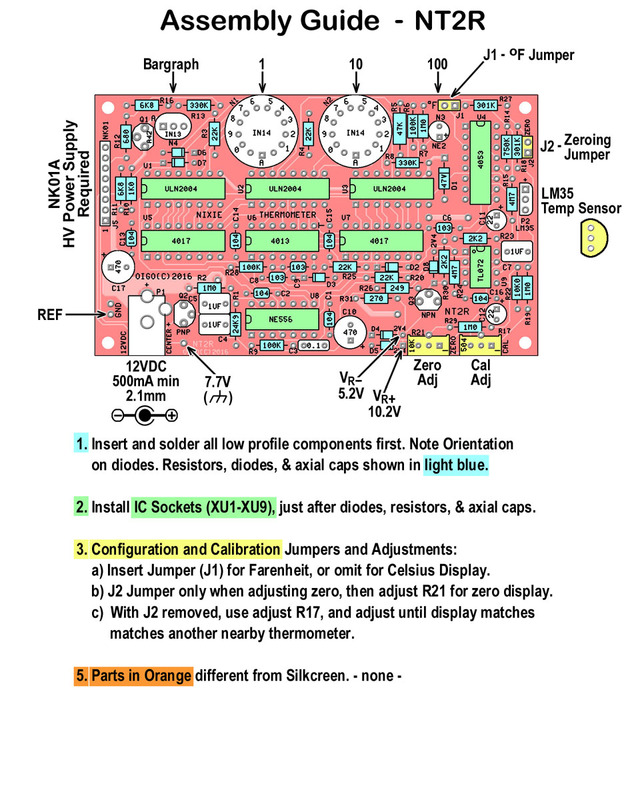 The output of the LM35, is intended to show Celsius, by outputting a voltage of 10mV per degree C. If that is what is desired, then leave off the jumper, J1, and the LM35’s voltage will pass current, Ic, thru R18 and R27. A total resistance of nominally, 600K. If Fahrenheit, is desired, then DO install the shorting jumper across J1’s terminals. This will parallel R14 across the 600K of R18 and R27, This forms a 333K resistor, which allows 1.8X (9/5ths) more current to pass, for the same voltage. A 10 degree change in Celsius is the same as an 18 degree change in Fahrenheit. But 0C is equal to 32F, so there’s a 32F offset, that must also be included. That’s the function of R15. It adds the current corresponding to that 32F offset, when Fahrenheit is selected. When calibrating this circuit, first zero the circuit. do this by temporarily shorting the jumper , J2. Then adjust the zero trimmer, R21, until the output is near zero. Next remove the jumper. Get another thermometer, that you trust. Insert the shorting jumper into J1, if you intend to display Fahrenheit, or NOT if you wish to display Celsius. Adjust the CAL trimmer until the display matches, that other thermometer. In addition to the dual slope integrator, this kit includes the counter chain, nixie drivers, and timing circuitry, to make this kit fully functional. 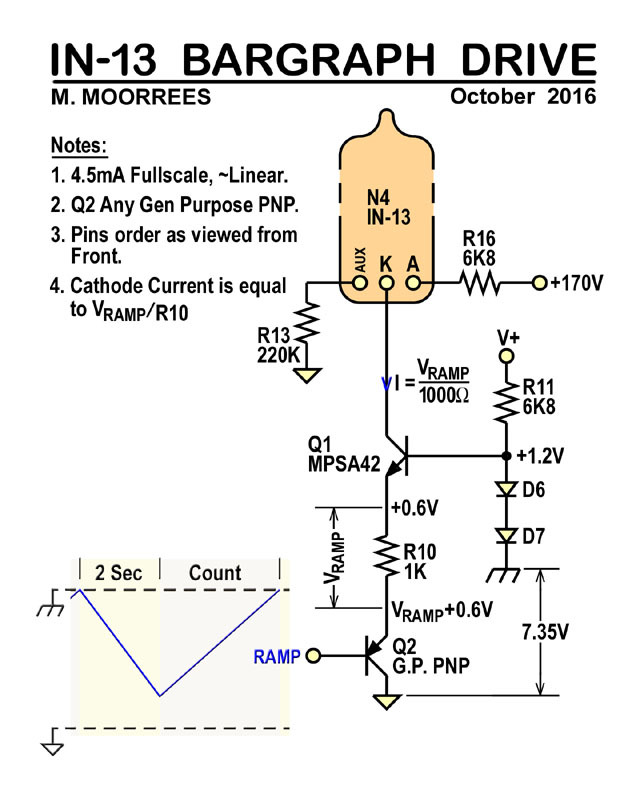 The output of the ramp feeds a voltage comparator, made from another op-amp stage, of U9, which outputs a logic-1 when zero volts is present. This trips a flip-flop, that in turn pulses half of a NE556 Dual Timer, which generates the 2 second charge period. Once the this time expires, the output drops to a logic one, which will flip analog switch to discharge. It also enables the counters formed by U5 and U7. The other half of the NE556 is wired to pulse at a 64Hz rate. These pulses are counted for the duration, of the discharge period, until completely discharged, and the cycle repeats. The outputs of the 4017 counters are directly fed to darlington inverting buffers, that directly drive the nixie tubes. A CD4017 (U5 & U7) have 10 outputs corresponding to the actual count, so only one of these outputs is high, at a time, which in turn is connected to its own buffer stage, and nixie numeral. U1 thru U3 each have 7 darlington buffers. Though the output is rated for only 50V max (ULN2004), this is quite adequate for properly driving the cathodes of nixie tubes. Its biased such that voltage across R10 is equal to the Ramp voltage. The current is simply this same voltage divided by R10. This current is the emitter current of both Q2 and Q1. The collector current of Q2 is the same as the cathode current of the bargraph, and is roughly the same as the emitter current. If the hfe of Q2 is 25, the variation, between these two currents is 24/25ths, or 96% of each other. For higher hfes, they track even closer. This circuit will also work with the IN-9 bargraph tube. The IN-9 only has two pins, missing the auxiliary cathode. The Anode (A) and Cathode (K), however, are in the same locations. The IN-9 draws more current. 12mA full scale versus 4.5mA, for the IN-13. To get decent glow travel, reduce R10, from 1K to 470 ohms, when using an IN-9. Note (April 5, 2017): R19 shows a 1M resistor. However, both additional 1M and 750K resistors have been shipped in the kit, so either of these two values can be used in that location. With the new. revised zeroing procedure, the 750K seems more fit, in final calibration. Make sure all the parts, with a box, in front, come with the kit. 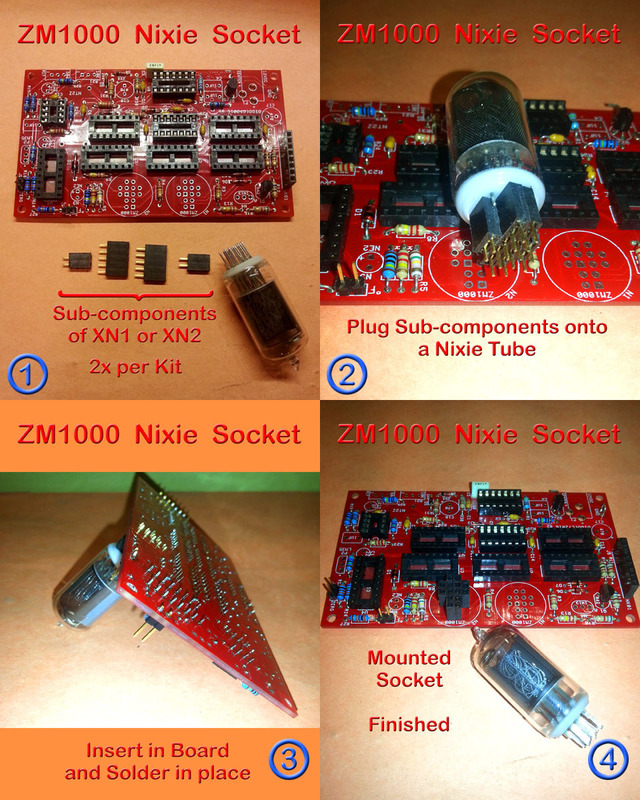 I am, initially, making these kit to accommodate the ZM1000 nixie, and the kit will include 2 such nixie tubes, N1 & N2. 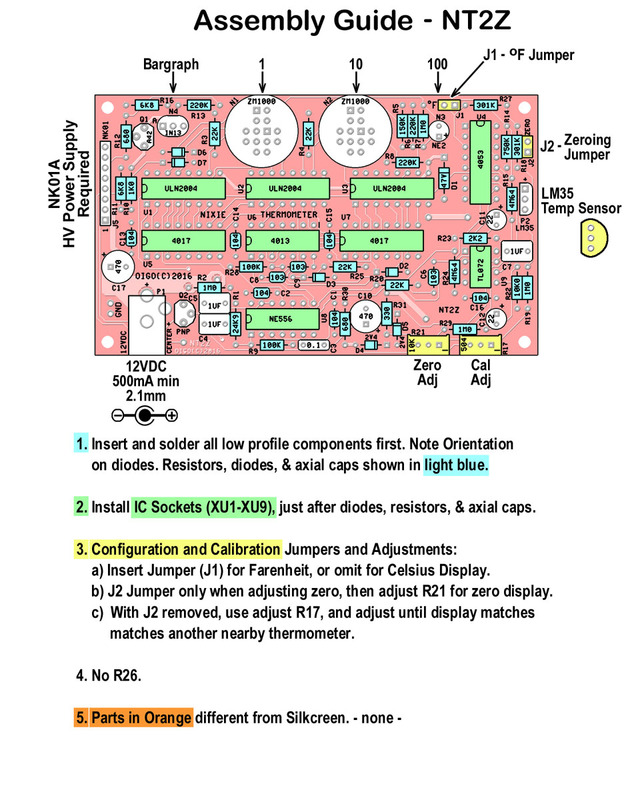 The IN-13 (or IN-9) Neon Bargraph, is optional, and not included with the kit. Two items needed, but not included are the 12VDC wallcube regulated power supply, which you need to buy separately. and the NK01B (or NK01A) HV power supply that plugs into J5, and provides the 170V, to power the nixies. The HV supply, is one of my other kits, which I normally stock. 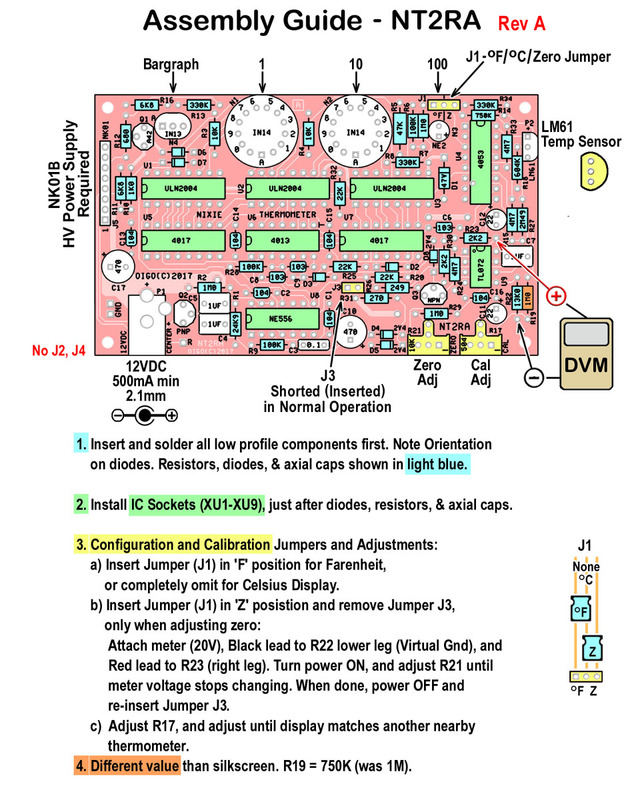 I do not stock the 12VDC supply. Note (April 5, 2017): During calibration, it has been found that a 750K resistor works better at location R19, than the 1M shown. Additional resistors of both values have been included in the kit. As always, make sure the proper components, are in the correct location, and in the correct orientation. This circuit contains no programmable devices. All components, other than the nixie tubes, and bargraph, are still being made and readily available. Replacement parts are relatively inexpensive and easily acquired. The NT2ZA has an added J3 jumper. In normal operation, this jumper is to be installed (shorted). Its there to disconnect the 556 output, during the zeroing procedure. Its only a temporary disconnection. This version does not come with any tubes. No Nixies nor bargraphs. The buyer must get the tubes elsewhere. Its designed specifically for the Russian IN-14, but can easily fit the Russian IN-8-2 (note, not the IN-8), and Hivac XN11. All three are wire leaded nixie tubes. 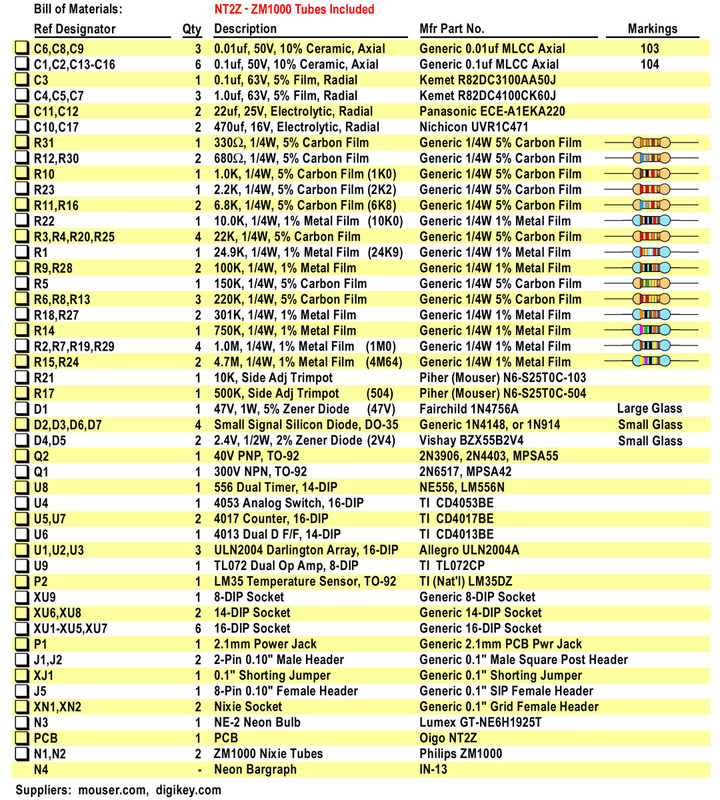 NT2RA uses the LM61 while all other versions use the LM35 ! NOTICE August 11, 2017: On the zeroing procedure. Do this with the LM61 (P2) sensor removed from the circuit ! Otherwise it will be in error !! 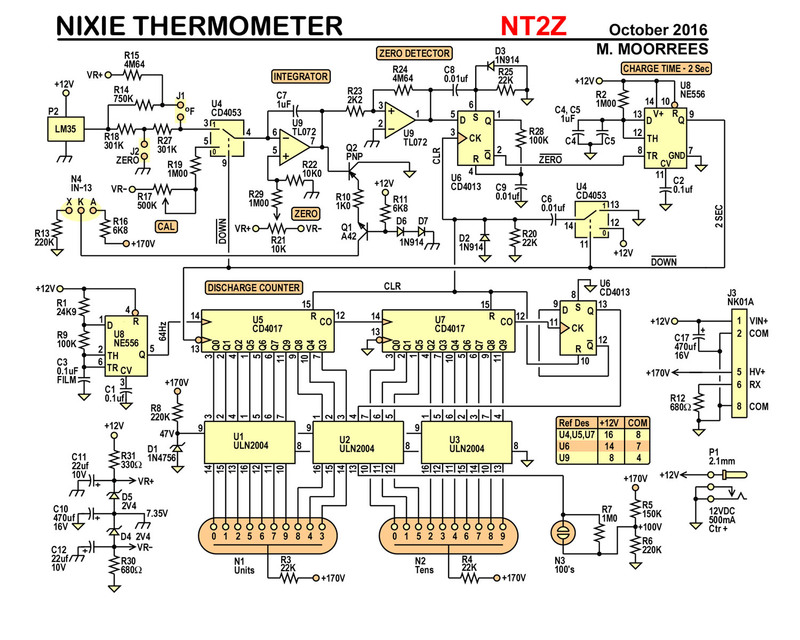 The NT2R and NT2Z circuits are mostly the same. 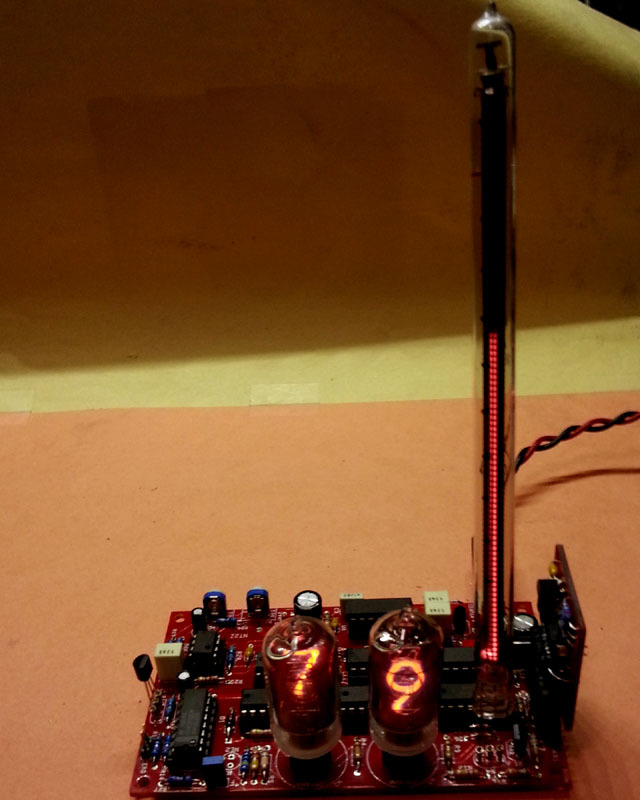 Obviously, the PCBs are different to accommodate the different model nixie tubes. There are also some small enhancements. 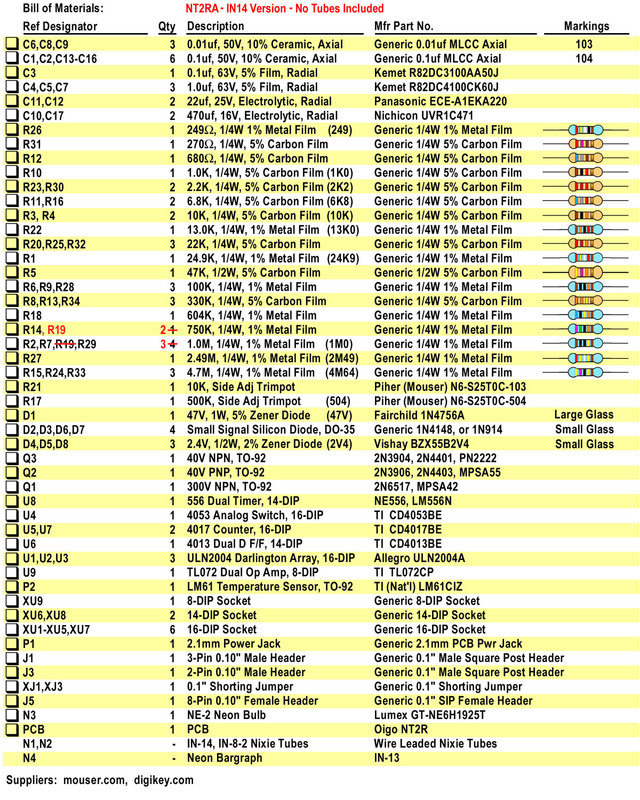 Some of the resistor values have changed. These are R5, R6, R7, R8, R13, R30 and R31. Both versions work just fine. The NT2R version just delivers more current to N3, the neon bulb. 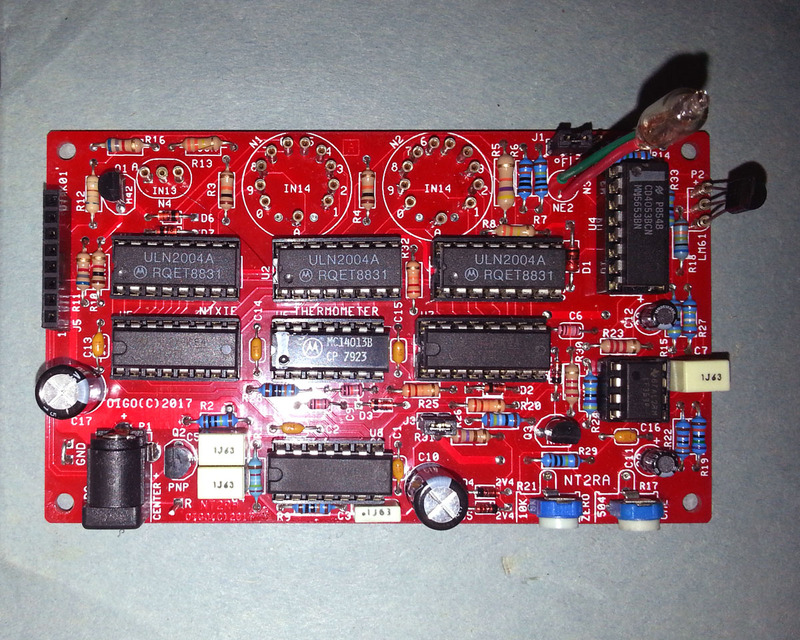 Also the voltage reference circuit has been altered, adding Q3, D8, and R26. This improves calibration retention when the supply voltage changes. 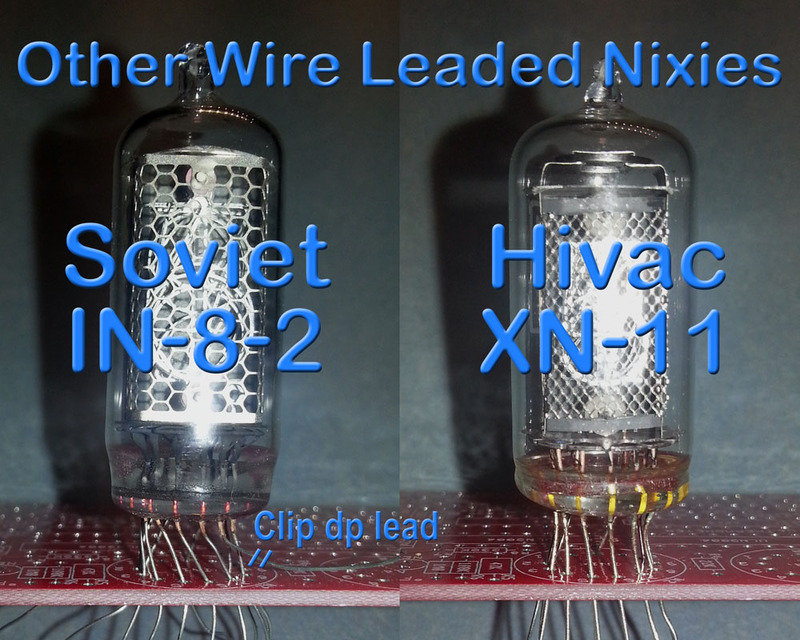 Due to some value changes, and using different nixies, the parts used between versions, are not exactly the same. Mostly the same, but not exactly. In addition to some value changes, and the improved voltage reference circuit, the pad layout, for the trimpots (R17 and R21) have also been corrected, to accommodate several models of trimpots. Its been noted that the “zero” pot shows little change over its travel, and the zero procedure is almost not needed. It does however, does effect accuracy, can be used as a fine adjustment, during the “cal” phase, of adjustment. J1 & J2 have been consolidated into one 3-pin jumper, so now there is no J2, and there never was a J4. J3 must have the shorting jumper inserted for normal operation ! NOTICE August 11, 2017: On the zeroing procedure (3b). Do this with the LM61 (P2) sensor removed from the circuit ! Otherwise it will be in error !! The NT2R is layed out specifically, for the IN-14 tube. However, the IN-8-2 and XN11 nixie tubes can also be used, with little modification. See the drawing below, to see how their wire leads are to be routed to the board pads. Note the twist in the wires. To minimize stress on the glass, it is recommended that the wire leads, be greater than 10mm (>7/16″). Basically, insert the Fahrenheit Jumper onto J1, to get the 1.8X current. But for Celsius, you need to get rid of the 32F offset, so R15 (750K) needs to be omitted, or removed. The counter frequency now has to be divided by 1.8 to get it back to displaying Celsius. As shipped its 64Hz, but for this mod, its to be 35.6Hz. Changing R1 to 4.99K and R9 to 200K, will appropriately shift the frequency. This mod only works for versions using the LM35 sensor (NT2Z, NT2ZA, & NT2R). 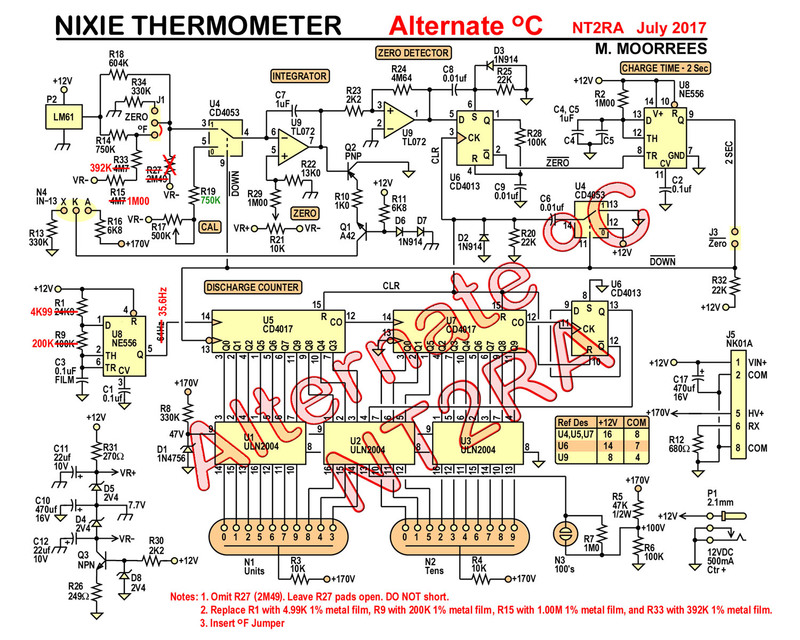 Will not work, as shown for the NT2RA. The LM61 has a positive offset of 600mV. To change between Fahrenheit and Celsius, the amount of negative bias is altered, but present in either case. The LM35, having no offset, needed no negative bias. when presenting Celsius temperatures. This mod, needs the addition of 4 resistors, instead of two, for the LM35 versions. All metal film, which has better temperature stability, than carbon film resistors. 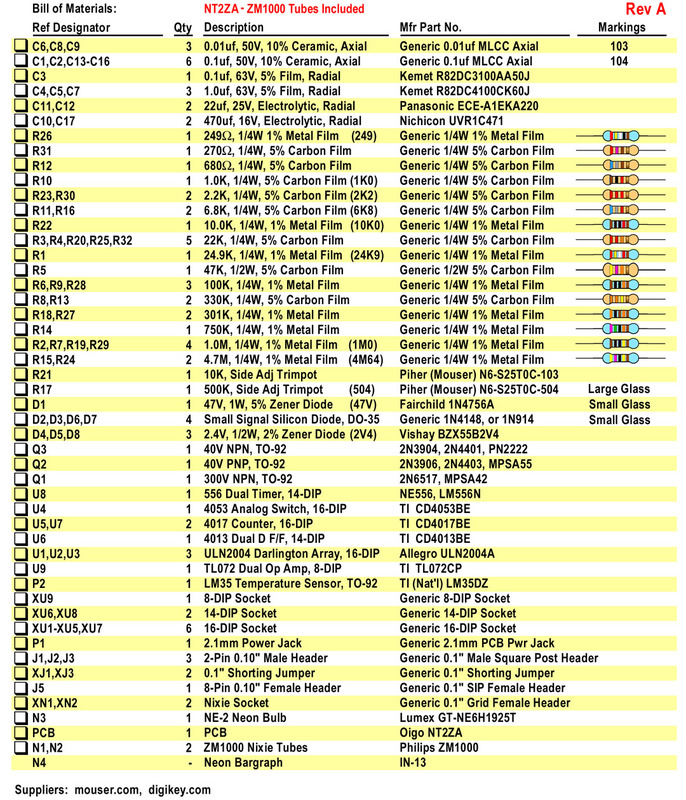 A word on metal film resistors. For values under 1M, they are inexpensive, and readily available, in E96 values. Over 1M, and the price triples. In single quantities, a 1% metal film resistor costs 8 to 10 cents. Over 1M, and prices start at 32 cents, and not all E96 values are available. There are a few sensitive analog circuits on this board. To get proper operation, this board needs to be clean after assembly. You can use any of the three following solvents: (1) Ethanol (grain alcohol), (2) Isopropyl Alcohol, or (3) Acetone. Make sure that your “alcohol” is at least 90% alcohol, for it to work. Scrub the solder side of the board with the solvent. Use a liberal amount. A tooth brush is a great tool for this. Repeat applying solvent and scrubbing, until most of the flux residue has been removed.